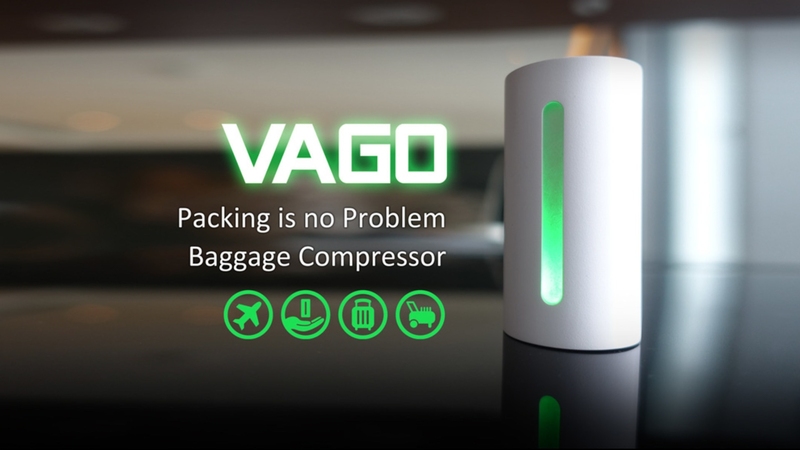 Taiwanese design company Creation Cell is announcing the Q3 release of its latest innovation, VAGO, a baggage compression device that allows travelers to save up to 50% space in their bags and suitcases. The company is also running a campaign on leading crowdfunding site Kickstarter. VAGO works by essentially vacuum packing all the soft items, such as clothes and towels, creating more space for anything extra. All soft items are placed inside a plastic bag, the VAGO is attached and turned on then, thanks to a smart sensor which detects the pressure inside the bag, compression automatically stops when it reaches a maximum. Available in white, black, purple and pink models, and at just 70mm long and 85g in weight, VAGO is small, lightweight and easy to carry and charges using the same micro USB cable as a regular smartphone. VAGO will be available in large retail channels worldwide in the third quarter of 2016. Established in Taiwan in 2010, Creation Cell specializes in designing convenient products and gadgets for the tech, travel and lifestyle industries. The company’s innovations are sold in more than 80 countries worldwide and have featured in a number of global media publications including USA Today.